of daily life in Kuusamo Lapland! Have you ever heard about the Midnight Sun? It's a phenomenon that occurs in the proximity of the Arctic and Antarctic circle where the sun does not set at night. Is the contrast to the polar nights, where the sun keeps hidden below the horizon. Sounds like magic? It feels like it. Lapland is situated on the Arctic circle and enjoys both periods. The Midnight Sun happens during the summer months, while the Polar Nights take place during winter. The Midnight sun allows you to enjoy incredibly long sunsets observing the sun coming down until the horizon but staying there during the night. This gives Lapland endless days and light to enjoy the nature, or summer festivals as the Midnight Sun Film Festival. In Ruka-Kuusamo we celebrate the beginning of the summer period as well! In the Ruka and Kuusamo Midsummer fest you can enjoy traditional Finnish music or dance all night long! But for those who prefer the relaxation of our landscapes and the wildlife, there is plenty to do as well. The Midnight Sun period is perfect for wildlife watching. The constant light helps to spot the Moose or the Bear, and the nature is just so alive that you will feel like in the middle of nowhere : just the nature and you. If you would like to experience we have a large catalogue for summer holidays in Lapland, just visit our website! The Midnight Sun is coming, are you going to miss it? Next Sunday will be a special day for many women in Finland. The second Sunday of May is celebrated in Finland the Mother's Day, or in Finnish, Äitienpäivä. It was in the late 1920's when the day was declared official. To celebrate this day mothers receive normally flowers and lovely hand-made cards from their children. 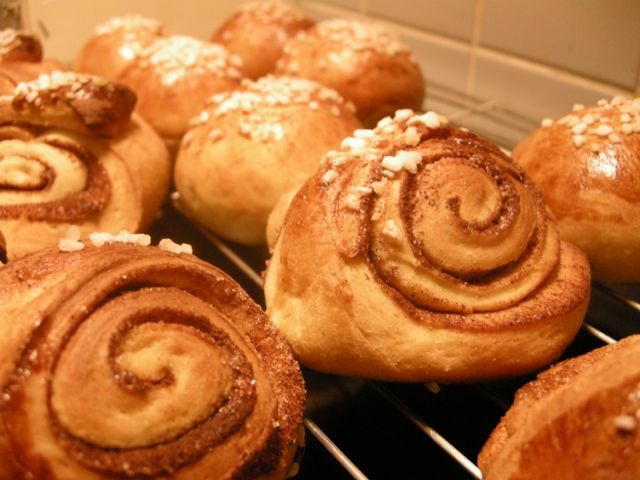 It is also common that the mother gets breakfast in bed, with coffee and fresh pulla pastries, o even home-made cake. This day is as well, since 1947, official flag day. In Finland there is some holidays when Finnish flags are displayed at least in the public buildings. It is common that many individuals raise the flags too in many of these days. Some known days when the flags are raised are Mother's Day, the day of the Kalevala (also celebrated as the day of the Finnish Culture) and the Labour day, Vappu. There is some unofficial flag days as well that because of popular tradition display the flag, such as the father's day. Would you like to celebrate the Mother's day with us? Give your mother an unforgeattable experience in Lapland! 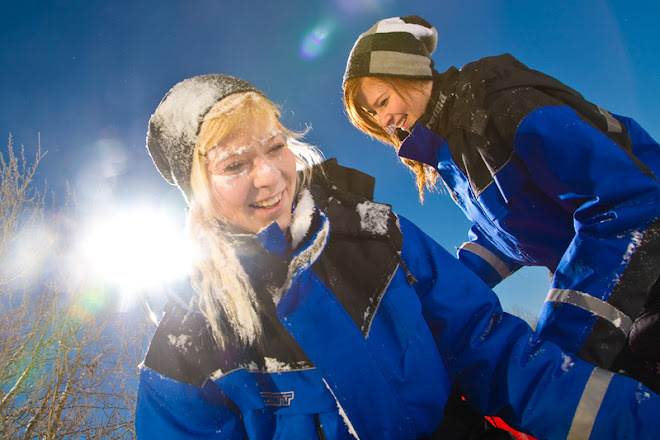 St. Lapland is on Twitter now! We in St.Lapland do not only offer unforgettable experiences in Kuusamo, we also like to share them! 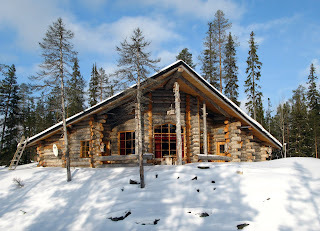 Because of it St.Lapland has increase its influence in the web by joining Twitter. Connect with us in Twitter to share your experiences during your holidays in Lapland, your pictures with the huskyes in winter or with the midnight sun in summer! Don't be shy and ask us for any doubts you may have, we're here to respond. Don't forget we also have a Facebook where we share unique pictures and try to bring Kuusamo and Lapland closer to you. Follow us in Twitter and become fan in Facebook! When people ask me what do I love the most in Finland, I have three words to say: “Revontulet” (or Northern lights), “Pulla” (typical Finnish pastries) and “Sauna”. Of course I definitely love the stunning beauty of Lapland´s different seasons, mostly winter, plenty, plenty of snow, and many other things, but those 3 small details always make my day. People, especially Finnish, are very shocked when I say I love sauna, because I come from a very warm place (Barcelona!) where the last thing you would think about is to get into a closed hot room. If you want to sweat, you just have to wait for summer and you will sweat every minute of the day and night. But sauna is different. Sauna is not about sweating, is a place to rest your body and your spirit. It is a tradition in Finland, every home has a sauna and from children to grandparents, everybody uses it. It is important, nonetheless, always to take some precautions: you need fresh water close to don’t dehydrate yourself; if you feel it’s starting to become hard for you to stay on the sauna, go out and refresh a bit if you will stay longer; and don’t do any efforts inside, just relax. To be honest, the first sauna is often overwhelming. It is hard to stay in such a hot and small place, especially for not very open minded people. But you should not give up, no way! Because when you get used to it, it becomes the best part of the day, you feel how your muscles relax and your skin is cleaned and you just let your mind fly away somewhere. Be careful, because sometimes it flies so away you can fall sleep! But, afterwards, you really feel like heaven. Traditionally Finns have some branches of young birch tied together in a whisk they call “vasta” that use to hit gently on the skin. It helps the skin to “open” and be better cleaned. Personally I have never used one of those, but what I love to do while saunabathing is something most people think is crazy: I just LOVE to run to the snow and jump on it and then return fast to the sauna. Believe me when I say it feels great! There is something more which is traditional for Finns and that most of the foreigners can’t really do. Finnish people go to the sauna naked, because it is place to clean your body and spirit, where nothing else matters. I’ve been living quite a long time on a dormitory where there was only international students, and most of them could not “deal with it”, and keep going with swimsuit and feel embarrassed to look at the rest of the people. In that cases I use a Spanish idiom that says “Allá dónde fueres, haz lo que vieres”, what means you have to embrace the culture of the places you visit, so in that case, don’t feel any shame! Pictures are from Isokenkäisten Klubi, a place with five saunas, one of them a smoke sauna and one a lake side sauna, the rest electric saunas. The book “Sauna – The Essence of Finland” presents the Finnish Sauna with its meanings and traditions and makes it understandable to foreigners. Sauna is Finnish Wellbeing, but it is by no means a spa experience. In the book our strange and very strong connection to the sauna is well described, in words and with pictures. There are for sure many surprising things you will learn about Finnish Sauna, e.g. that even dogs love it, there are concerts held in a sauna and that the sauna tradition includes also the things you do after the sauna. Another fascinating thing is that a sauna is not a fixed, defined space, there are many, many different saunas in Finland. The mother of all saunas is the smoke sauna, the most traditional one, these exist since “the beginning of times”. Finns living abroad miss the sauna and I have heard about a tent sauna being put up on a beach in Thailand as well as in a suburb in South Africa. We are also very good at reinventing the sauna, time and again. The ice saunas have become quite popular and it is a surreal experience to have a hot bath in a building made of cold crystal clear ice. The Finnish Sauna is a way too wide and important thing to write only one entry about. Therefore we will share a series of sauna experiences with you, reflecting on how Finns and foreigners feel about the sauna. You are most welcome to share your sauna experiences and thoughts, comment and ask questions! 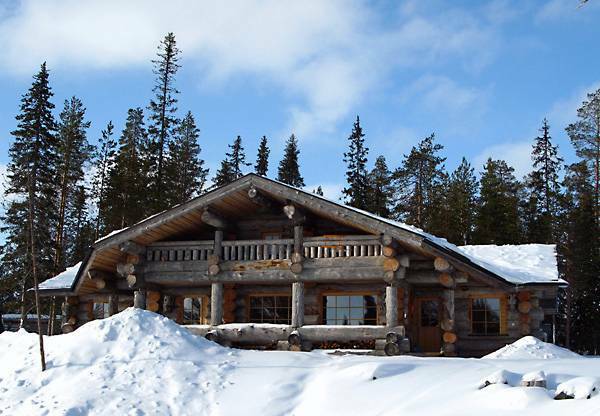 There is a place in Ruka where luxury and traditional Finnish nature collide. Chalets with all the facilities you can ask for and more but only a few steps from the unspoiled forest. And this place has a name, of course: Rukan Salonki. First time I was there I was guiding a group of tourist, so I didn’t really have the time to enjoy the surrounding. That’s why I convinced some friends and we went there to spend a few days in those chalets. When I told them about the chalets, they were very suspicious, and it was understandable! What would you think if I tell you to spend some days in a chalet with sauna, many bathrooms, kitchen, TV, living room, Internet connection… and especially after seeing pictures of the place, where everything is wooden and the decoration makes it cozy but still impressive? For sure you would think it would be too expensive, so my friends did! But high-quality doesn’t mean exorbitant prices. If it was like that, how a group of young people and students as my friends could enjoy those facilities? I prepared a program where we could always have time on the evening to relax and enjoy the chalet and the surrounding, because they are worth it. The first impression my friends had when arriving to the chalets was a homogeneous “woow”. They started looking around amazed; they could believe that chalet was ours for a few days. “Look, there is a fire-place! And look at the TV! Have you seen the rooms? And there is even sauna! This is awesome!” – they were saying all the time. That first night, when everyone was more exited and had plenty of energy, we took some kick sledges that were next to the chalet and started exploring around. Of course we had the hope to see northern lights, because the resort is far enough to spot them without light-pollution interruption, but we weren’t lucky that night. Anyway, we had lots of fun with the kick-sledges and the feeling of freedom the place gave us, like if we were really far from any civilization. After that, we had to warm ourselves, so what’s better than our own sauna in the chalet? Afterwards we were so relaxed that fall sleep immediately until the next morning. The next morning we had breakfast in the restaurant that is the centre of the resort, Kultala, and we enjoyed a buffet with homemade bread, jam, coffee, tea, chocolate, cookies, cornflakes, ham… whatever we needed for a new day. Later that day, when we came back in the evening after a day outdoors I had prepared a surprise for my friends. When we arrive into the chalet again I told them “take your towels and follow me! No questions allowed!”. They were surprised, but they know me well enough to trust I would bring them something nice. But this time they didn’t even imagined what I was going to show them. 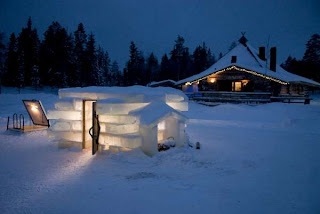 An ice sauna! Sounds strange, I know, but it is true. A sauna built of the ice. We had that amazing experience together and then we decided to have dinner on Kultala, since I told them the food was good and they could see that at breakfast. The menu was some reindeer rolled with vegetables, salad, soup, homemade bread and a sweet dessert with berries. Everything was great! The last evening we decided to take some snowshoes and walk around hunting for northern lights, enjoying the nature and the beautiful Lappish sky (for me is always awesome with so many millions of stars). Since it was our last night there, after a sauna (it is always very pleasant after a day outdoors), we watched a film on the big screen we had on the chalet while some of my friends connected to the Internet to share those days we spent. The next morning we had again a delicious breakfast at the cozy restaurant Kultala and spend some time playing with the snow and the sledges on the ice slope they had next to the lake until our transportation came. A friend of mine who loves photography took incredible pictures of the area with the day light and then, once home, we compared with the ones she was taking at night time, and they looked so different it didn’t seemed the same place. At the end, after all the experiences they told me “You were right, that place definitely worth it”. On one of my trips while guiding was to a fisherman’s village. Even if you don’t like fishing, you would like this programme. We step out from the bus and were by a huge completely frozen lake. A cozy “kota” was nearby and the fishermen were already waiting for us. They all were very excited and smiling, what surprised me, how can someone love so much fishing? After introducing themselves, we put our way out to the lake. Most of the people were quite worried, maybe even a bit scared, because they had never seen such a big frozen lake, and they were not sure about stepping on the ice. Then Tuomo, the owner of the place, standing on the frozen lake asked the children “who wants to go on a snowmobile?”. The children of course ran to him, into the middle of the lake, while all the parents held their breath... I thought it was a very good strategy, because then everybody saw it was completely safe to go on the ice. We walked some meters, leaving the “kota” behind, and we stopped next to a kind of stick standing on the middle of the lake. Tuomo explained us it was an important part of the ice-fishing, because it points you where you made the hole, and so also prevents anyone to fall in there by accident. Then he started explaining how the ice-fishing is done, asking always volunteers to help him. At the beginning the people were not sure to be so close to the hole, but later everybody wanted to help. We had some nice catch with the net, and then it was time to try the individual ice-fishing. We could make a hole on the ice and then sit by it and try to catch something with a rod. He said the most important thing was the patience, that sometimes you could stay there for hours and get nothing, but that was what Finns love: the calm and the silence, where they could just relax and think. And be happy even when not catching any fish for hours… We were very lucky with that, because one of the children was very excited about it and following every single word Tuomo said during all the activity, and so he sat by a hole and waited there completely quiet and doing exactly as Tuomo said. And this gave him a prize! He caught a fish, but he was so surprised when it pulled the rod that he let it go. Nevertheless, Tuomo was not angry and we all laughed at the situation. After the fishing experience, we came back to the kota and it came out it was the restaurant Tuomo and her wife run. 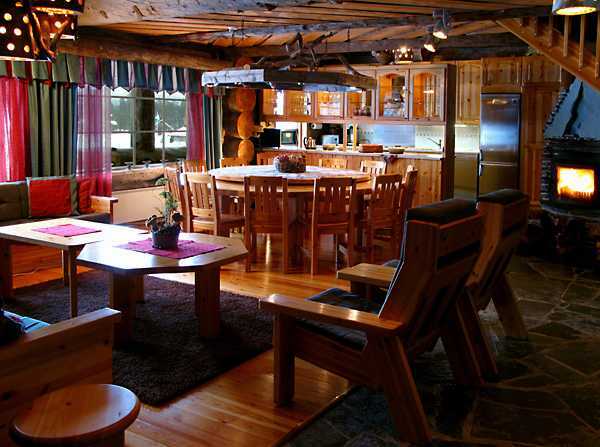 It was a very traditional Lappish kota, with the fireplace on the middle and the tables around. Everybody whispered “hmmm!” once we felt the smell of the food and the warm of the kota after our fishing time. Tuomo explained his wife is in charge of the restaurant, cooking with her own traditional receipts, and always served the fish that lake gave. It was really surprising they could get so much fish from the lake, especially because all the fishing was done in a very traditional way. How many hours they would spend fishing? Definitely, they had to love it. The lunch was a very diverse buffet with all kind of fish prepared in many different ways, different kind of potatoes, salads, vegetables, house-made bread, berry juice and delicious sweet desserts. I’ve never liked fish very much (my mother was always complaining I only liked one kind of and always cooked the same way) but I tried everything in the buffet because everything looked delicious, and I’ll never regret tasting all of it! Everything tasted so nice taste I had to take more! Many people was asking about the decoration inside of the kota, from wooden sculptures to reindeer and elk horns, and Tuomo was kindly explaining the story behind all of them, always smiling. I really felt like home at that restaurant. But it is not possible to stay there forever, so when it was time to leave and we step into the bus again, Tuomo and all the rest of the workers went out to say goodbye while the bus was driving away. You can find Fisherman's Friends in our Winter Fun! programs and Fisherman's Delicacy Buffet in our Countryside Restaruants selection. St. Lapland consists of eight family run companies with a long history in creating unforgettable travel experiences in the region of Kuusamo Lapland. We have joined forces to offer you our exclusive and individual services more efficiently. Create your perfect holidays in Lapland!